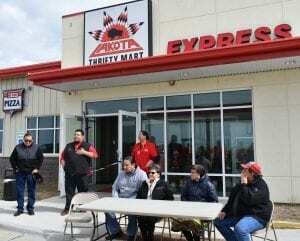 After years of hard work, dedication, and overcoming many obstacles, the staff of tribally-owned Lakota Thrifty Mart opened the doors of the new Lakota Thrifty Mart Express in Takini on Tuesday, April 9. Over 100 community members attended the grand opening ceremony along with tribal dignitaries, including Tribal Council Representatives Ryman LeBeau and John Kessler, Treasurer Benita Cook-Clark and Vice-Chairwoman Bernita InTheWoods. LTM Manager Tyson LaPlante gave opening remarks to kick off the ceremony. 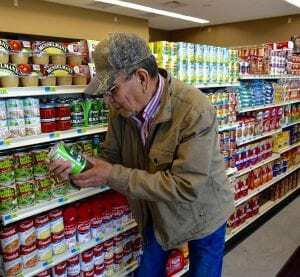 LaPlante said although the infrastructure of the store was completed over two years ago, the dream to provide a store in the west end of the reservation began in 2010 with his late-father, long-time LTM Manager Bernie LaPlante. “This feels really great. It’s a huge relief, and we are happy to now be able to service the west end,” said LaPlante. Harold Condon then conducted the opening prayer and gave a speech afterwards about the important and positive impact the store would have on the lives of the west end community members who would potentially drive up to an hour and a half to reach Eagle Butte or Dupree for groceries. Each elected official gave speeches thanking everyone for their hard work and efforts to open the store and encouraged tribal members to support the tribally-owned business to ensure its success. “This is your store. The more people shop here, the more money is kept on the reservation. Let us support it [the store] and make it successful,” said Kessler. LaPlante finished the round of speeches by thanking local community members who kept a vigilante eye over the property in the two years since its construction. “I want to thank the people for helping keep the building safe. It is a testament to how much people love and wanted this store. It is good to bring services and jobs to our people. Today is a big step in serving the people,” said LaPlante. Dean Dupris then performed a prayer song which was followed by the ribbon cutting ceremony, conducted by LaPlante and LTM Assistant Manager Tennille Scott. Everyone was welcomed into the store for lunch, which included fried chicken, pizza, and various veggie and fruit trays. 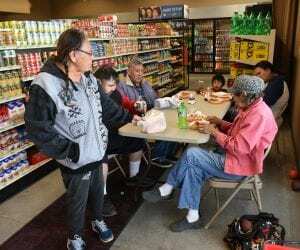 Community members entered and toured the store, which is not a typical gas station; rather, it is a mini version of the LTM grocery stores, stocked with fresh produce, various types of meat, dairy products, canned and home goods. Other available household items include diapers, cleaning and hygiene products. The store also has a Hot Stuff Pizza deli that serves fried chicken, pizza, taquitos, and burgers. Prices are comparable to those found at the LTM grocers in Eagle Butte and Dupree. Twenty-four-hour gas and diesel services are also available. According to LaPlante, the store will soon have capabilities to accept SNAP benefits and WIC checks, which he hopes will be a big draw for surrounding communities. Currently, there are nine employees who are from the Cherry Creek, Takini, and surrounding areas. Within one year, their combined paid income could be as high as $120,000 — a positive labor income impact on the overall economy on Cheyenne River. LaPlante said other services and products such as fishing tackle may also be added in the future, and he encouraged people to offer suggestions for expanding products. The LaPlant store is projected to open within the next few months, LaPlante said. The Takini LTM Express will be open from 6:00 a.m. to 8:00 p.m. every day. Call-in orders for chicken and pizza will need to be placed at least one hour ahead of pick-up time, and big orders 24-hours ahead of time. The store number is 605-538-4110/4111.